Railroad Detective Landon J. Osborn, Sr.
Railroad Detective Landon Osborn was struck and killed by a hit-and-run driver on John Street, near Fourth Street, while patrolling the railroad yards in Hamilton County, Ohio. Detective Osborn had served with the Chesapeake and Ohio Railroad Police Department for 15 years and had previously served with the Dayton, Kentucky, Police Department. He was survived by his wife. NEVER FORGET! 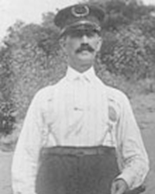 On behalf of the Westerville, Ohio Division of Police, we honor the dedicated service and ultimate sacrifice of Railroad Detective Landon J. Osborn, Sr. of the Chesapeake and Ohio Railroad Police Department, Railroad Police and the additional 62 American Peace Officers who have paid the ultimate sacrifice on this date in history.